Schuberth reinvented the jet helmet with the new SCHUBERTH O1. A modern design and stylish colours, with three shell sizes and six helmet sizes so that every biker can find the right size – and it always fits securely. 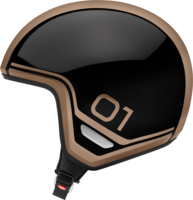 THE O1 OFFERS EVERYTHING YOU’D EXPECT OF A MODERN HIGH-TECH HELMET. The unique manufacturing methods used for helmet shells at SCHUBERTH keep the weight low, whilst retaining optimum stability. Direct Fiber Processing (DFP) is an innovation developed by SCHUBERTH. Ergonomically shaped ShinyTex® padding for better head ventilation – seamless, highly functional and breathable, detachable and washable, as well as certified in accordance with Öko-Tex 100.